Wavenergy.it Ltd has been working in the first full-scale realization of the innovative technology of the Resonant Wave Energy Converter 3 (REWEC3, known as U-OWC too) integrated into the breakwater of the Port of Civitavecchia (The Port of Rome, Italy), which covers an overall length of 524m. The REWEC3 is a wave energy converter belonging to the family of Oscillating Water Columns (OWCs) incorporated into a traditional vertical breakwater of monolithic reinforced concrete structure type. The REWEC3 may be considered as a strong improvement in the OWC technology, removing several important limitations of past applications and demonstrating to be a very cost-effective and resource-efficient plant. At present, a fully developed REWEC3 wave energy converter is under testing in real world condition at the port of Civitavecchia, where there is the potential for having an installed power of about 2.2-2.5 MW over 124 independent absorbing chambers, each equipped with a turbo-generator set of about 18-20 kW. It is noteworthy that, thanks to the expected performance of the REWEC3, we will install in the Mediterranean Sea, which has a moderate wave energy potential, the same installed power per chamber adopted, for instance, in the Atlantic Ocean. Figure 1. Working principle of a Resonant Wave Energy Converter 3. Left panel: behaviour under wave crest action. Right panel: behaviour under wave trough action. coupled to an electrical generator, installed into the air duct, is driven in this way to produce electrical energy. It is noteworthy that the new solution of REWEC3, with the adoption of the small vertical U-shaped duct, even if does not introduce significant modifications in the structural feature, radically changes the physics of the plant with respect to classical OWCs. Indeed, sea waves do not propagate to the inner chamber, but the oscillations of the inner water surface are induced by the wave pressure fluctuation at the opening of the vertical duct. Such a configuration provides useful properties from the perspective of wave energy exploitation providing the possibility of tuning during the design stage the natural frequency of water column oscillations to the desired period, so that the energy efficiency of the plant is strongly improved with respect to classical OWCs. It is seen that the REWEC3 can provide improved energy performances than those of a conventional OWC both with swells and large wind waves. This property is crucial for applications in the Mediterranean Sea, where the wave energy resource is only moderate, and is extremely attractive for applications in Oceans. The REWEC3 technology has been adopted by the Port Authority of Civitavecchia in the works of enlargement of the port of Civitavecchia (Rome, Italy) as an innovative solution to the problem of improving port safety in comparison with traditional vertical breakwaters. Specifically, 17 REWEC3 caissons are under construction (see Figures 3-4-5), and 8 are about completely built. Figure 3 shows the vertical and the horizontal cross-sections of a REWEC3 caisson in Civitavecchia. This configuration was designed with the objective of maximizing the energy harvested by a single absorbing cell. Specifically, each REWEC3 caisson is 33.94 m long and includes 8 independent absorbing cells (vertical duct and pneumatic chamber) 3.87m wide. 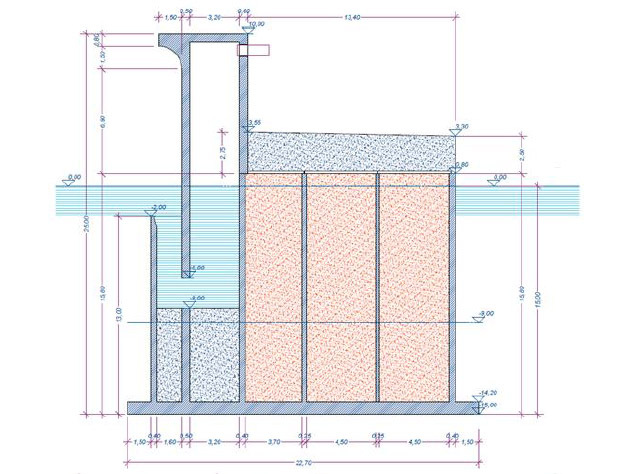 The vertical duct is 1.60 m wide and the U-duct opening is located 2.00 m below m.w.l., so that the opening is not always below the free surface, while the pneumatic chamber is 3.20 m wide. The passive part of the REWEC3 reminds the classical vertical breakwaters, thus based on the associated construction techniques. The lowest part of the active cells of the caissons are filled with concrete in order to ensure both the overall stability and a monolithic behaviour of the structure, while the cells of traditional caisson are filled with sand and concrete. The total cost to build the REWEC3 caissons have been fully covered by APC via funds of the Italian Government (CIPE, “Legge Obiettivo”). From a strict economic perspective, it is mentioned that the extra-cost for building a REWEC3 caisson with respect to a traditional breakwater caisson has been estimated about 5-7%. This relates to the fact that the REWEC3 is built with the same construction techniques of a traditional breakwater (pre-built reinforced concrete caisson, in dry docks, which is sunk in situ by filling sea water). Further, it is emphasized the fact that the adoption of the REWEC3 by the Italian authorities in charge to the Port Autority of Civitavecchia was based on its advantages as harbour protection structure, irrespective of the possibility of utilizing it for producing electrical energy. Indeed, the REWEC3 integrated into breakwaters demonstrates to be more efficient in harvesting wave energy than existing alternative solutions. Therefore, the REWEC3 is currently under construction without turbine, generator or any other electrical/mechanical element used for producing electrical energy (one turbine was built with the support of a TEN-T project – see the next section). However, the available infrastructure is made ready for the installation of any PTO system. Figura 5. 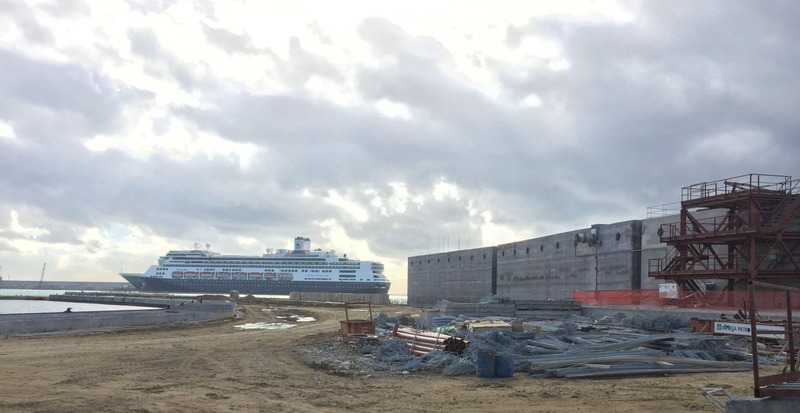 Pictures of the Civitavecchia Port during the construction of REWEC3 caissons.